Choctaw Casino KOA Park – the #1 KOA Park in the country! Choctaw Casino KOA Park includes a RV Park with 77, 12’ X 80’ concrete pull-thru pads, full RV hook-ups with 50 amp electrical service. Each space has a covered table and grill with a nearby gathering space, pool, showers and beverage center. To assure peace of mind, there are hourly security patrols of the park. All sites are premium sites. 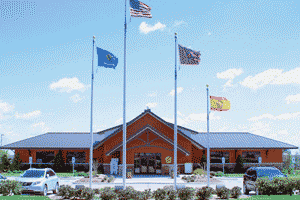 The Durant/Choctaw Casino KOA welcomes large groups and offers special packages. The main building includes meeting room with 100-plus seating, fully appointed kitchen, fireplace, plasma TV, laundry room, clean restrooms and showers. The business enter is equipped with computer station and internet access. The game room has a pool table, air hockey and shuffleboard. The vending room has assorted electronic video games. Outdoors, guest can relax in an outdoor salt water pool (closed during the winter:, covered patio, fire pit and playground.